Nine months ago when I moved from Noida to Pune, packing the stuff that I had gathered in 4 years was a huge task at hand. I wanted to make sure that the least lands and ends into landfills. Although my habits don’t generate much waste and I do dispose it properly from time to time. Here an approach I used during shifting, the packing and segregation of things began 1 month in advance. As I intended to carry only the basic stuff with me, here’s are some tips to dispose your leftover stuff. Online reselling worked wonders for me. Sulekha.com came very handy. I sold my old study chair/table, 1 bed, 2 cots, cooler, fridge, Tv trolley, a small-sized cupboard through online sale completely hassle free. Utensils/kitchen items/boxes that were not required were packed off for my maid as she asked for it. Blankets/mattresses, pillows to my maid and her daughter again. The stuff that was in no reusable condition required safe disposable and assured recycling. Finding out a reliable recycler in Noida proved very tough. 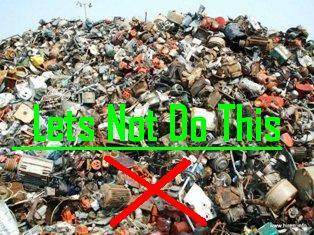 Worst kind of waste: E-waste – batteries, chargers, old phone – Attero (http://www.attero.in/) a recycling company in Noida, seemed reliable as STMicroelectronics had set up Attero drop boxes in their premises to collect e –waste. I deposited the E-waste in the office Attero drop-boxes. Noida: Eco wise: http://www.eco-wise.biz/ I had a tough time dealing with them, as I had to adhere to their collection timings, dropped the idea as their noon timings did not suit me. Delhi: Kabadiwala http://www.kabaadiwala.com/ Not a friendly experience, as I had less quantity of waste, so they were reluctant to collect if from home. Finally, I myself went in search of local scrap dealers in Khoda basti, next to the sector I lived. I had doubts if they really recycle, after some hankering, they gave a contact no. of a person Rizvan Mallik in some Noida sector, and he collected the stuff from my home. With this, I eliminated the possibility of 90-97% of the waste being dumped into landfills. I ran out of time and steam otherwise, if you live in Noida and looking for recyclers do try Eco-wise they will be more reliable. Wow! Awesome efforts… Not many of us get the mind to dispose that we have used for a long time.. unfortunately we get stupidly attached to the materials that we have used. What you have done is really appreciable.. Useful! 🙂 Great Job! Wise and nicely done. Not many of us get to leave behind the things that we have used for a long time, that’s because of a stupid sentiment we have attached to the things that we have been using. Useful and great job! A big thanks for all your encouraging words and appreciate your gesture to follow my posts. Its better to reuse as much as we can, against discarding and replacing with new ones all the time. But beyond a certain point if one is just accumulating, its good to put it to better use. Aakanksha – I have never tried the selling bit but I do get tremendous satisfaction by donating/passing on (to my cousins or others in the family) and recycling. Great stuff .. though i would i love to do much more than i am currently doing ..
Good post here…got to know about few things which we usually ignore.. Thanks Hemant, its indeed high time that we shed the habit of blissful ignorance from our lives, and connect to our surroundings. Today the big problem is huge quantity of garbage. Plastic bags are the main content of the garbage. Packed and sealed culture responsible for the huge amount of garbage. We have to purchase open products. If it is necessary to purchase packed product try to compress it before throwing. Recycling is also important solution. I second you on that.